GARDAÍ IN DUBLIN have appealed for information about a car stolen with an infant child inside, before the vehicle was found 45 minutes later earlier today. The incident happened at Park Vale in Baldoyle at about 7.30 am when the car was taken with a 13-month-old in the back seat. Gardaí said that details of the car were circulated to mobile units and following a coordinated search operation it was located in the Clongriffin area at 8.15 am. Gardaí confirmed to TheJournal.ie that the baby was kept in the car the whole time between when it was stolen and when it was located. The child was unharmed during the incident and gardaí say that no arrests have been made. Gardai released an image of the car in question and are appealing for witnesses. They are particularly appealing to anyone who observed the car taken in the incident between 7.30am and 8.15am to contact them. The car is a dark navy Opel Vectra hatchback registration number 05D 66688. Anyone with information is asked to contact gardaí in Howth 01 6664900, Raheny 01 6664300 or the Garda Confidential Line 1800 666 111. 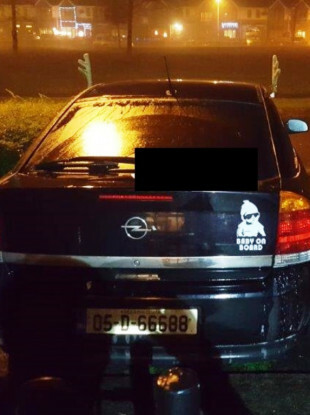 Email “Gardaí appeal for witnesses after car stolen in Dublin with 13-month-old baby in the back seat”. Feedback on “Gardaí appeal for witnesses after car stolen in Dublin with 13-month-old baby in the back seat”.